Is this the final cut list for first phase of Central City in Motion projects? 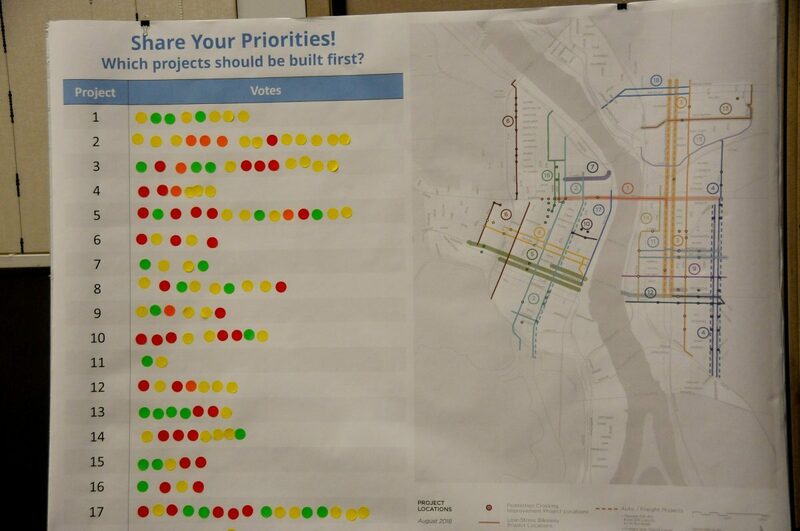 PBOT map of Central City in Motion projects shared by Business for a Better Portland today. 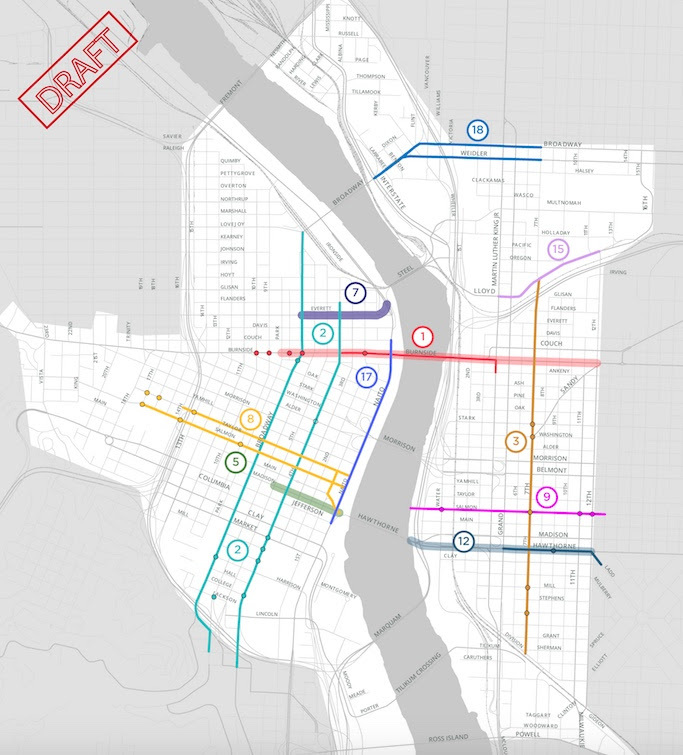 One week after an open house where the public was asked to rank a list of potential projects to be funded through the Central City in Motion plan, the Portland Bureau of Transportation has trimmed the list from 18 to 11. PBOT also seems to have axed key parts of two remaining projects. At least that’s how it appears in an email just sent to members of a local, pro-business advocacy group. The map and list of projects provided by BBPDX is different than the map shown at the open house last week. The most recent map made public by PBOT showed 18 “project bundles” (a mix of protected bike lanes, crossing updates, and enhanced transit lanes). The map revealed in the email from BBPDX today shows just 11 projects — two of which have had key elements removed since last week. Compare the map above with 11 projects to this one from last week with 18 projects. PBOT has $9 million already dedicated to the projects and expects a total budget of $30 million. The agency is making its final efforts to garner feedback and come up with a list of “transformative” projects that can be built right away (which likely means spring/summer 2019 when construction season begins again and the requisite engineering and design work can be completed). In addition, the new map no longer shows SE Clay and Madison streets being part of project #12, which would now only include changes to SE Hawthorne. Project #3 has also been changed to only include changes to SE 7th. It no longer shows crossing updates to SE 6th or the bus/freight/transit-only lanes proposed for the Martin Luther King Jr. Blvd/Grand Avenue couplet. Project votes from the public at an open house on September 18th. My ballpark estimate shows that PBOT has sliced about half of the $72.3 million price tag from their list of 18 projects, bringing them much closer in line to the expected funds they have to spend. 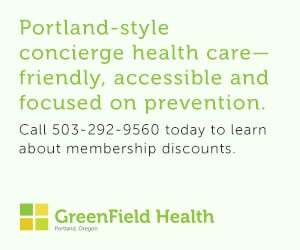 The email from BBPDX is supportive of the projects overall and demonstrates a collaborative relationship with PBOT. This stands in contrast to the recent statement from the Central Eastside Industrial Council which urged its members to voice concerns over how the Central City in Motion project would reduce parking in their district. 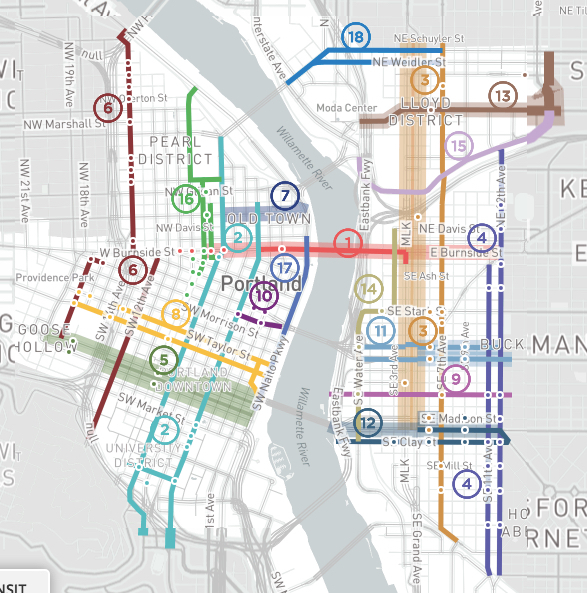 We have not seen any publication of this new map or an explanation of the prioritization decisions from PBOT. We’ve reached out to them for comment and will update this post when we hear back. The post Is this the final cut list for first phase of Central City in Motion projects? 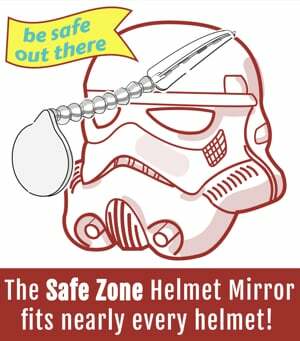 appeared first on BikePortland.org.